If DON - THE CHASE BEGINS was deadly expect its sequel, DON 2 to be deadliest! Atleast this is what the first trailer promises to be. 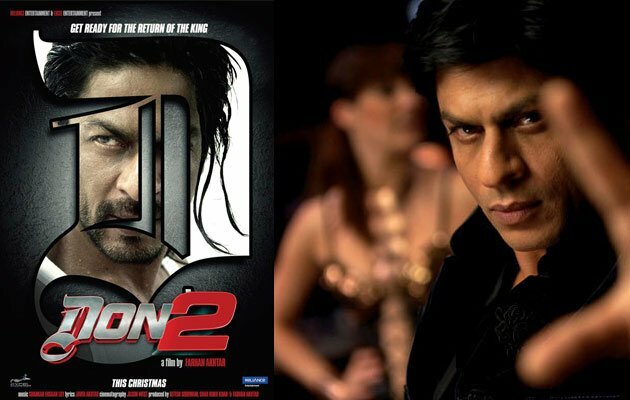 The King of Bollywood, Shahrukh Khan returns as the deadliest and dangerous don in DON 2. The trailer is a must watch for Shahrukh's grungy look, his trademark style, the way he flaunts 'D' tattoo lights cigar, the stylised action sequences and stunts and the corny dialogues mouthed by Don himself. The slickest shots, the pacy remix of prequel's version and with superstar's presence - thefilm is already giving a feel of blockbuster! Like its first part, DON 2 has been written and directed by Farhan Akhtar. The music is by Shankar Ehsaan and Loy. If you thought its easy to do do away with DON, then indeed its not. As the Don is back to settle his scores. As he rightly says in the film Ab mujhe koi nahi rok sakta.Truly DON ko pakadna mushkil hi nahi naamunkin hai!